"We have to get back to the spiritual law if we are to survive." As a "Faithkeeper," Oren Lyons is the person responsible for passing on and interpreting his people's traditions, legends, and prophecies. 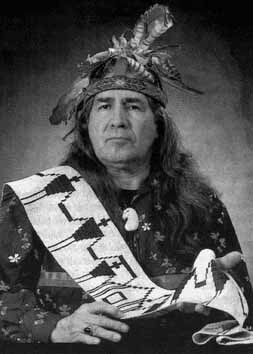 He is a Chief of the Turtle Clan of the Onondaga, one of the Six Nations in the Iroquois Confederation. Moyers talks with him in his cabin on Onondaga land in upstate New York. Lyons' words are startling both for their historical perspective and their practical value. Giving a history lesson which will be news to many Americans, he explains how the Founding Fathers of the United States drew upon the American system of government when making their plans for the nation. As early as 1744, Benjamin Franklin was present at a meeting where the Six Nation chiefs advised the governors of Delaware, New York, and Pennsylvania to form an indivisible union. People around the world today are looking to America for democracy but "America got the ideas of democracy and freedom and peace from the Indians," Lyons explains. Except for one important ingredient, Lyons contends. "They refused to use spirituality as a part of the nation. Our advice to you was a spiritual center," whereas the United States system separates church and state. "We said, 'Problem coming.' "According to Lyons, the problems which can be traced to a lack of a spiritual law, have kept coming through the centuries. The Chief is a prominent member of the international environmental movement, and he speaks eloquently and forcefully about the degradation of the earth. "The law says if you poison your water, you'll die. The law says that if you poison the air, you'll suffer. The law says if you degrade where you live, you'll suffer. The law says all of this, and if you don't learn that, you can only suffer." The prophecies of the Onondaga Nation underscore this point. In 1799 the legendary figure Ganyahdiyok or "Handsome Lake" was given a vision of the future and saw environmental disasters including air and water pollution. The Chief explains what this legend means to him. "It's certain that this will happen, but it's up to each generation to see that it doesn't happen in your generation." Lyons comes across in this one-hour program as a practical visionary. He is also an accomplished artist. As he tells the stories which have guided his people through the centuries, the cameras pan across his paintings of the Great Tree of Peace and the early history of his people. Repeatedly, he emphasizes the importance of community to the Onondaga, from their games to their ceremonies.On the practical level, he talks about living day by day, the importance of not taking ourselves too seriously, and accountability to the next generation. "When you sit in council for the welfare of the people," he says, "you council for the welfare of the seventh generation to come so that when their time comes here they may enjoy the same thing that you're enjoying now. I'm sitting here as the seventh generation because seven generations ago, those people were looking out for me." Lyons' discussion of time is particularly interesting. "People don't operate in the world time or, say, the time of the mountain. They operate in the time of the human being. And that's probably not a good idea because the time of the human being is rather short." Without a reference point in the world's time, as we've seen in American history, "You can get yourself and your people into a lot of trouble." This long-term perspective is the essence of a spirituality which must be recaptured for our sake and for the generations to come. It's prophesied in our Instructions that the end of the world will be near when the trees start dying from the tops down. That's what the maples are doing today. Our Instructions say the time will come when there will be no corn, when nothing will grow in the garden, when water will be filthy and unfit to drink. Then a great monster will rise up from the water and destroy mankind. One of the names of that monster is "the sickness that eats you up inside" like diabetes or cancer or AIDS. Maybe AIDS is the monster. It's coming. It's already here. Our prophet Handsome Lake told of it in the 1700s. He saw Four Beings, like four angels, coming from the Four Directions. They told him what would happen, how there would be diseases we'd never heard of before. You will see many tears in this country. Then a great wind will come, a wind that will make a hurricane seem like a whisper. It will cleanse the earth and return it to its original state. That will be the punishment for what we've done to the Creation. Listen to the words of the Creator given to the first United Nations -- the Haudenosaunee -- over 1,000 years ago. The Chiefs of the Haudenosaunee shall be mentors of the people for all time. The thickness of their skins shall be seven spans, which is to say that they shall be proof against anger, offensive action, and criticism. Their hearts shall be full of peace and good will, and their minds full of a yearning for the welfare of the people. With endless patience, they shall carry out their duty. Their firmness shall be tempered with a tenderness for their people. Neither anger nor fury shall find lodging in their minds, and all their words and actions shall be marked by calm deliberation. In every nation there are wise and good people. These should be appointed Chiefs. They should be the advisors of their people and work for the good of all the people., and their power comes from the "Great Peace." A chief must never forget the Creator of mankind, never forget to ask the Creator for help. 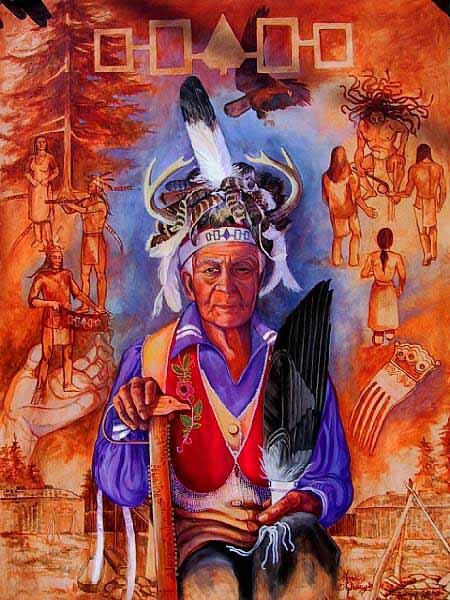 The Creator will guide our thoughts and strengthen us as we work to be faithful to our sacred trust and restore harmony among all peoples, all living creatures, and Mother Earth. We were instructed to carry a love for one another and to show a great respect for all the beings of this earth. In our ways spiritual consciousness is the highest form of politics. When people cease to respect and express gratitude for these many things, then all life will be destroyed, and human life on this planet will come to an end. These are our times and responsibilities. Every human being has a sacred duty to protect the welfare of our Mother Earth, from whom all life comes. In order to do this we must recognize the enemy -- the one within us. We must begin with ourselves. We must live in harmony with the Natural World and recognize that excessive exploitation can only lead to our own destruction. We cannot trade the welfare of our future generations for profit now. We must abide by the Natural Law or be victims of its ultimate reality. We must abolish nuclear and conventional weapons of war. When warriors are leaders, then you will have war. We must raise leaders of peace. It is no longer good enough to cry, "Peace." We must act peace, live peace, and march in peace in alliance with the people of the world. We are the spiritual energy that is thousands times stronger than nuclear energy. Our energy in the combined will of all people with the spirit of the Natural World, to be of one body, one heart and one mind for peace.